Sea Shepherd is like the Batman of the ocean: an eco-vigilante group willing to travel where governments can’t (or won’t) to hunt down poachers, preserve ocean habitats and protect marine species. Since its founding 40 years ago, the organization has been involved in campaigns in pretty much every single body of water, including hunting Antarctic whalers, stopping poachers off the sunny coast of Syracuse, Italy, and intervening in the Faroe Islands’ whale hunts. In addition to relying on innocuous conservation tactics like documenting and filming poaching operations, Sea Shepherd doesn’t shy away from more confrontational intervention methods, like using their own boats to physically block the movement of fishing vessels, or shooting water cannons and stink bombs at target poaching boats. As the organization celebrates 40-years of marine conservation, Project Earth sat down with Sea Shepherd founder Paul Watson, to discuss the pros and cons of direct action, and the key to saving our oceans. We talked about pirates, politics, and much more. This interview was produced in collaboration with Under the Skin, who create limited edition, interactive screen prints of endangered species with 20% of proceeds going to animal charities. 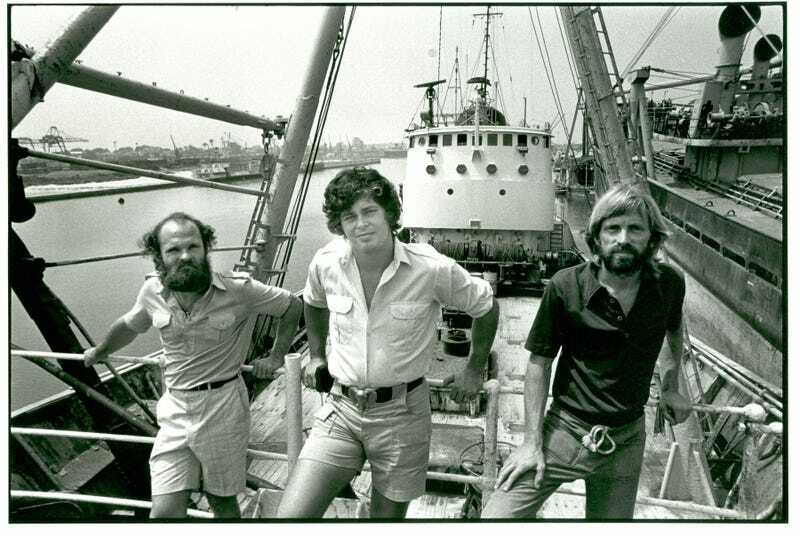 Project Earth: You’ve been working in marine conservation longer than I’ve been alive; how have the oceans changed in the past 40 years? Paul Watson: Plain and simple: the oceans are dying, and they’re dying at a very rapid pace. I remember the oceans in the 1950's, 60's and 70's, you wouldn’t have found a piece of plastic on a beach anywhere in the world. And now plastic pollution is one of the leading threats to the survival of marine life. And that’s just one threat. There’s also overfishing, illegal fishing, chemical pollution, sonic pollution, global warming... I’d say the entire ocean is at risk right now. And if the ocean dies we die. I’d imagine that over the years you’ve found yourself trying to convince people of the same points over and over again; does that sort of repetition frustrate you? Sea Shepherd has been criticized in the past for being too radical of an organization; can you speak to this and address the misconceptions that people might have about Sea Shepherd? People have misconceptions about pretty much everything, so I’m not too concerned with what people think. People call us a lot of names: eco-terrorists; militants; pirates. When they started calling us pirates I said: “Well that’s OK if you’re going to call us pirates, we’ll be pirates.” And we got our own pirate flag, and sure, pirates are somewhat romantic, but more importantly they actually got things done. They weren’t encumbered by bureaucracy. So, we aren’t either. We get things done. Let’s talk about that: what are the merits of direct action vs. political action? Direct action, or direct intervention as I call it, is important because it’s effective; it gets things done. Issue after issue are just debated endlessly, and nothing ever comes about. We shut down every single pirate whaling operation in the Atlantic in six months, which the political movement was unable to do in the previous 20 years. We shut down the entire Southern Ocean icefish poaching fleet, in four months, something that nobody was able to do it 10 years. So that to me illustrates the effectiveness of our approach. I call what we do “aggressive nonviolence.” We’re a nonviolent organization, we’ve never caused a single injury to a single person in our entire history. But we are aggressive. I also believe that the destruction of property that’s being used to illegally take life, is not a violent act. If a man’s about to shoot an elephant, a poacher for example, and you knock the rifle out of his hand and destroy it, that to me is an act of nonviolence. And what about the merits of politics? Do you think political action can also play a role in conservation? Not really. I can’t think of any social movement in history where politics has actually made any significant change in any meaningful way. It’s like Margaret Mead said: never depend on governments or corporations to solve any problem, they never have, they never will; all problems are solved through the passion and the involvement of individuals… Slavery wasn’t ended by the U.S. government, it was ended because of the passion of abolitionists, of slaves, of the Tubmans and Douglasses of the world. Women didn’t get the right to vote because of government, they got the right to vote because of the passion and courage of the suffragettes who fought there way to get that. What about the Paris Agreement? There are definitely flaws with the accord, but doesn’t the fact that 196 countries came together to sign the agreement show that politics is moving in the right direction? COP21 was a photo opportunity for world leaders and politicians, aside from that it didn’t really resolve anything... The entire Paris Agreement is non-binding, so nobody even needs to do anything that they don’t want to do... For example, the biggest darling of COP21 was Justin Trudeau, the prime minister of Canada. He promised this, promised that, and then gets back to Canada and basically becomes a platform for the oil companies. He wants to build new pipelines out of Alberta’s tar sands, which is one of the worst climate disasters on our planet. You know, he’s worse than Trump. In fact, when it comes right down to it, I have more respect for Trump than Trudeau, because at least Trump’s honest about it: he denies climate change. Trudeau says: “Oh it’s been extremely important,” but actually he doesn’t do anything about it. None of the pledges made at COP21 will amount to anything. It seems like you’ve got a lot of doom and gloom in your outlook; would you describe yourself as a pessimist? No. I’ve always been an optimist because I’ve studied the history of the planet. There have been 5 major extinction events prior to the one that we’re presently involved in. The Permian extinction wiped out 97% of everything, 250 million years ago. And what I’ve learned from those major extinction events is that it takes 18-20 million years for the planet to recover. So, 18-20 million years from now it’s going to be a pretty nice planet. All this talk about saving planet, you know it doesn’t mean anything. We’re not going to save the planet, that’s a little arrogant of us. This whole movement is about saving humanity from humanity.... What will the world be like 20 million years from now? It’s hard to say, but I know it’ll be lush, it’ll be vibrant, it’ll be life… in a way, if it weren’t for the Jurassic extinction, we wouldn’t be here. So 20 million years from now we won’t be here, but nature will carry on. If the odds of saving the planet, the one we currently have, are so small, then what’s kept you and Sea Shepherd motivated for the past 40 years? We don’t focus on if we’re going to win on this or lose that. Instead, we focus on actually doing things. And to do everything we can to stop the destruction, or extermination of the all the species that are on the brink of extinction... for example the campaign to save the Vaquita in the Gulf of California…there’s about 30 left, which is low, but other species have been brought lower than that and have recovered. I would say that if it weren’t for Sea Shepherd’s involvement…the Vaquita would now be extinct. For 3 years we’ve confiscated nets and arrested poachers… I feel we can win, and don’t give into the fact that we won’t. Other people say: “well, I’d like to support you on this but it’s a lost cause.” But the lost causes are the only ones worth fighting for anyway. A lot of Sea Shepherd’s work centers on saving charismatic species, like whales, turtles, and porpoises; can you speak to the importance, or issues, of focusing conservation efforts on these flagship species? It’s absolutely essentially that we focus on flagship species, like whales, and sharks and things like that, because they’re a way to gather support, and saving them ultimately protects the entire umbrella of species underneath. By focusing on whales, we’re focusing on the Southern Ocean sanctuary, and the ecosystem as a whole. And by focusing on the Vaquita, we’re also focusing on the Totoaba. But of course, that doesn’t mean we aren’t directly involved in conserving less known species; Sea Shepherd is involved in protecting sea cucumbers from poachers in the Galapagos, we’re involved in protecting phytoplankton, our Icefish campaign was trying to protect one of the ugliest fish in the oceans: the Toothfish... But, the way to get people to pay attention is first through highlighting these charismatic species. What do you think we need to change, both locally and globally, to stop the degradation of our oceans (and planet)? Diversity: that the strength of an ecosystem is dependent on diversity. Interdependence: that all living species depend on each other. Finite resources: that there’s a limit to growth, a limit to carrying capacity. Right now, we’re stealing the carrying capacity of other species, so our numbers and consumption can increase... The world was never meant to have 8 billion meat-eating, fish-eating primates. Evolution did not design it that way. After 40 years in conservation, what’s your take home message? What should we be teaching the next generation to best prepare them for the uncertain future? People sometimes ask me what should we teach our children, and my answer has always been nothing, don’t teach them anything. Encourage their intuition, encourage their imagination, let them explore what they need to do and cultivate their own passions and follow those passions. That’s really what we need. There’s nothing to learn from the previous generation, we’ve screwed things up so bad. Let that passion flow. And that’s the key to finding the impossible answer... I certainly don’t have the answers... But I have a lot of faith in young people today that their imagination, courage and passion will come up with the answers.